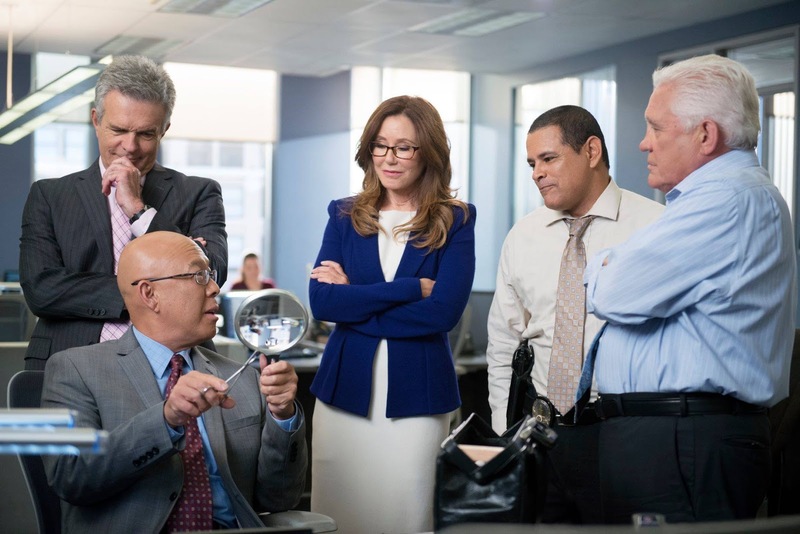 James Duff, Co-Creator and Executive Producer of Major Crimes returned to Facebook for his weekly chat with fans. This week he was joined by Michael Paul Chan, the actor who plays Lt. Tao. I was stuck on an airplane that was delayed (thanks, United) so I was unable to attend the chat, but I've put together the recap here. I may have missed something because of the delay, so please forgive any omissions. Before we get into the chat you may want to check out the last two installments of Identity: What's in a Name - The vlog featuring the character of Rusty in a story about a missing girl called Alice Herrera. The vlog has been intersecting a side storyline in the TV episodes. I also wanted to call out writer Kendall Sherwood for the Long Beach shout outs in last week's episode. Last October, I met Kendall, James Duff, Damani Johnson, Kathe Mazur, Jonathan Del Arco and Adam Belanoff at Bouchercon, the world's largest mystery convention. It was held in Long Beach. I'm not sure it was an intentional nod to their Bouchercon visit, but I laughed every time Provenza cursed Long Beach. And finally - BSG reunion tonight! Love that Jamie Bamber (Lee Adama) guest starred in this episode with Mary McDonnell (the former President of the Twelve Colonies, Laura Roslin). Now if we can just get Edward James Olmos (William Adama) to guest star - So Say We All. And now for the chat recap. As usual, I've only included James' replies since he's pretty good at including the question in the answer. I've also omitted anything that directly referred to the plot of tonight's episode. James Duff Hey everyone, welcome to our Facebook chat for our third episode this season! Sorry to be late but we had location photo review for episode 9! James Duff Tonight's episode features Jamie Bamber, who was a cast mate of Mary's in Battlestar Galactica, one of my favorite television series of all time. James Duff And Bill Brochtrup also recurs as Dr. Joe, Rusty's therapist. It's a great team as we cut back and forth between two mysteries, only one of which we can solve. James Duff I know a lot of people want to know if Sanchez will find peace. I would say looking for something vastly increases your chances of finding it. James Duff DeQuana Ellis asks if we'll see more of Amy Sykes! Certainly, we are! The week after next, Amy finds a witness to a murder that she has to work out how to protect. James Duff Gracie A wants to know if we will see more of what's in Raydor's desk drawers. Good question, Gracie! i'll think about it. James Duff Also, tonight, Rusty's v-log features Garrett Coffey, as Slider, Alice's killer. James Duff Hi, Evelyn David. Always nice to have you here. Yes, Jack Raydor comes back this winter and everyone who loves reading, Evelyn Davidhas several great mysteries with which you can fill up your Kindle! James Duff People are asking if we will be wrapping up the Stroh case. As far as I'm concerned, we have. Stroll has escaped, and he is no longer in the country. The murder of the judge trumps everything else Stroh has done; in essence, Rusty is no longer a witness. James Duff Joining me now for the rest of our chat is the eternally genius, Michael Paul Chan! James Duff And in episode eight this season, we visit the sets of Badge of Justice, the television show on which Tao consults. James Duff Helen L asks Michael which is his favorite episode of Major Crimes. He answers, very diplomatically I think, that it is always the one he's working on right now. James Duff I think he's done some amazing work on both series. The critical missing in The Closer where we found the boy in the pool was one. The episode of Major Crimes where an architect he helped convict of murder had his verdict voided. Last season's episode where he teamed with Luke Perry displayed the extent of Michael's range. James Duff Thank you for joining me here for our weekly get together. I love watching the show with you! And we'll do it again next week with Phillip P. Keene! James Duff Kathy D says she loves Tao being a walking encyclopedia. Michael Paul Chan says he needs a quiet room in the house to learn all the encyclopedic language he has to learn. James Duff Buzz Watson goes on his first tour of duty as a Reserve Officer of the LAPD, a ride along with Flynn & Provenza. What could possibly go wrong? James Duff MPC loves working with Kathe Mazur, who plays DDA Hobbs, or as we call her, Our Lady of Perpetual Pessimism. The whole cast loves Kathe. She was also in American Sniper and did a great job there as well. James Duff Michael Paul wants everyone to know how hard it is to memorize all the technical dialogue he has to recite. But once he gets it down, it's fun. James Duff DeQuana Ellis asks if we'll get a chance to meet Tao's wife. We've already met Tao's wife. She's done three episodes, I think, though mainly on The Closer. We would love to have Patty back for another episode this year. We plan to celebrate the graduation of Tao's oldest son from graduate school. James Duff Helen L loves to see Tao correct Provenza. I love it when Tao gets tough. There's a shot of him moving forward toward a suspect with his gun that remains one of my favorite moments of all time. James Duff I should mention that next week's episode revolves around an extremely expensive wedding that gets threatened by the discovery of a murder. James Duff By the way, Judge Grove returns tonight, played by Ron Marasco, who is not only a terrific actor, but an amazing writer whose book on acting is a must read. James Duff Honestly, there is nothing MPC (as we call him on our sets) can't do. Including surf!! James Duff Katie S says she's a "big fan of Chan!" So is my sister-in-law! She loves all the characters, of course, but MPC is her favorite. James Duff And that Buzz has issues with Flynn and Provenza as he tests out the limits of Stand Your Ground. James Duff Katie S notes that MPC has quite a movie resume, and wants to know how different it is doing a television series. MPC, first you have be nicer to everybody because you're going to see them maybe for years!But honestly, it's no challenge, it's a gift, says MPC. And to do this show on a weekly basis is an opportunity actors dream about. And I would say working with an actor like MPC is something writers dream about! It's no secret, by the way, that I call MPC the adult on our series. James Duff Gracie A asks why Tao changed from med school to being a police officer. He says in the episode that doctors have to spend a lot of time covering their asses. "We spend our time covering each other." That's the quote. James Duff Lots of people are asking if they just saw Mark Harmon's son, Sean Harmon! Sharp eyes, ladies and gentlemen. Yes, Sean has also done some MMA fighting and we wanted to make the scene as dynamic and authentic as possible. James Duff And when Lt. Tao just shut down the INTRANET, he was talking about a closed network used by the LAPD. Most law enforcement agencies use closed networks for the purpose of protecting themselves against hacking, etc. And that he loved shutting down the intranet. James Duff A couple of people are asking if Jon Tenney will be coming back as Deputy Chief Fritz Howard. Yes, of course! Jon is a great actor and a terrific friend and we can't wait to have him back. He's in episode seven and eight (back to back appearances). James Duff Next week, Flynn and Provenza! James Duff Ilona Arcari asks if we are going to have a Christmas episode this year! In our fall and winter eight episode season, we will celebrate both Christmas and Thanksgiving this year. James Duff Stroll should be considered a transnational threat. I do not consider him a genuine threat to Rusty anymore. In fact, he only used Rusty to distract people from his escape.